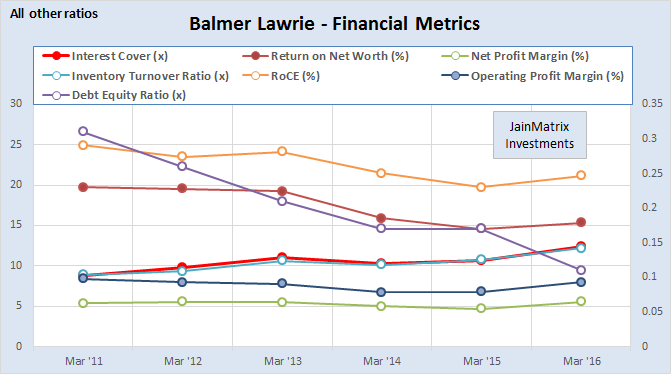 We had published a report on Balmer Lawrie and Co (BLC) on 17th Oct, 2016. This is a follow up report where we have changed our recommendation due to significant recent events. The share price is now Rs 1,085 giving our investors a 60% return in a span of 2 months. The sharp rise is due to a bonus issue declared. The firm approved on Nov 10, bonus shares in the proportion of 3:1, giving 3 new Equity Bonus Shares for every 1 share held as on the record date. BLC fixed Dec 27, 2016 as the Record Date for Issue of Bonus The share will quote ex-bonus thereafter. The share is likely to fall by 75% ex bonus. The main reason the share has risen so sharply is that there is high interest from traders to purchase the share before bonus, which may later be sold ex bonus to book a loss on short term capital gains. This is also called Bonus Stripping. (to find out more about this, visit LINK. To do this yourself, please also consult your Chartered Accountant and Investment Adviser). There is no other significant event in the firm (it continues its steady progress). We expect selling in this share to intensify post bonus ie after 27th Dec. The current PE is 18.7 times, much above the 5 year historical average of 8 times and above the Oct 2014 peak of 14 times. 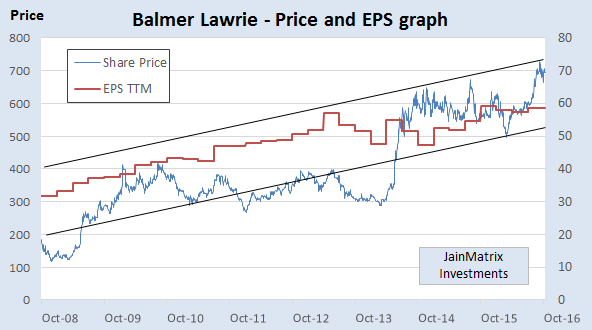 Hence we recommend investors in Balmer Lawrie to SELL, as the valuations have shot up sharply and it has moved into overvalued territory. Additional details: Here is the brief on the company and the price history. Overview: Balmer Lawrie & Co is a diversified PSU firm into Travel and Tourism, logistics, Industrial packaging, greases, lubricants and Leather chemicals. In each of these areas it occupies good niches. The FY16 revenues were Rs 3,229 cr. and profits 179 cr. The Revenues, EBITDA and Profits of BLC are up by 7%, 6.8% and 7.3% CAGR over 7 years. The balance sheet is strong and RoCE is over 21%. Investors have got a return of 34% CAGR over 8 years. Price History: Here is a chart of the recent 6 month share price performance. We hope you make handsome gains on BLC. Visit and bookmark www.jainmatrix.com for such valuable investment reports and updates. This document has been prepared by JainMatrix Investments Bangalore (JM), and is meant for use by the recipient only as information and is not for circulation. This document is not to be reported or copied or made available to others without prior permission of JM. It should not be considered or taken as an offer to sell or a solicitation to buy or sell any security. The information contained in this report has been obtained from sources that are considered to be reliable. However, JM has not independently verified the accuracy or completeness of the same. JM has no known financial interests in Balmer Lawrie & Co or any related firm. Neither JM nor any of its affiliates, its directors or its employees accepts any responsibility of whatsoever nature for the information, statements and opinion given, made available or expressed herein or for any omission therein. Recipients of this report should be aware that past performance is not necessarily a guide to future performance and value of investments can go down as well. The suitability or otherwise of any investments will depend upon the recipient’s particular circumstances and, in case of doubt, advice should be sought from an independent expert/advisor. Punit Jain is a registered Research Analyst and compliant with SEBI (Research Analysts) Regulations, 2014. Any questions should be directed to the director of JainMatrix Investments at punit.jain@jainmatrix.com. Why Buy Now: 1) It has been restructuring and strengthening operations by exiting weak segments and undertaking investments in logistics, warehouses, distribution, manufacturing and lubricants. Cash with the firm will be deployed very productively over 2-3 years. 2) The share price has fallen 7% from a recent high of Rs 748. This gives investors an opportunity to enter at lower prices. 3) The cash on balance sheet* is high (Rs 161/sh. ), so BLC operations are available for Rs 516. Buy with a target price of Rs 1,057 by Mar 2019, a 56% upside from current price levels. 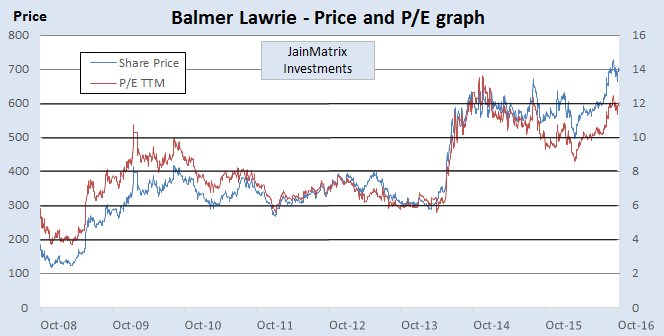 JainMatrix Investments had reported on Balmer Lawrie in Nov-2013 with CMP of Rs 306. Since then, the stock is up 121% in 3 years. See link – Balmer Lawrie – A Steady Boat. We continue to be positive. 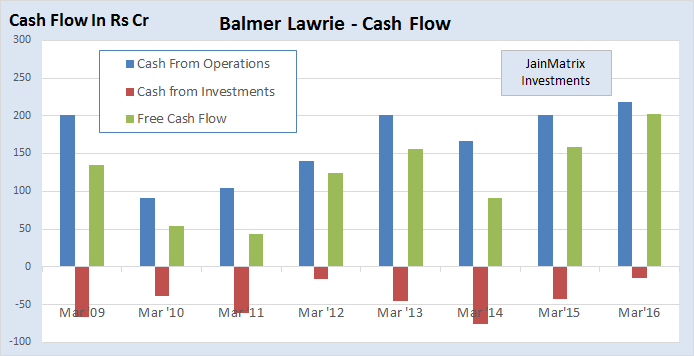 Here is a note on Balmer Lawrie & Co (BLC). BLC is a 150 year old firm, and is a PSU under Ministry of Petroleum and Natural Gas. Based in Kolkata, this is a Mini-Ratna I public sector enterprise. The FY16 revenues were Rs 3,229 cr., profits 179 cr. and market capitalization today is 1,980 cr. It has 5 JVs and the global operations have about 1,729 employees. Travel & Tours – Travel (Ticketing), Vacations & Money Changing Activities. Greases & Lubricants – Globally BLC is a top grease maker, and its brand is Balmerol. Industrial Packaging – barrels and Drums made of Plain Steel and many variations. Leather Chemicals, Refinery & Oil field Services, etc. Travel: BLC is one of the oldest IATA accredited travel agencies in India. The travel segment operates in 88 locations in 19 cities in the country with a good clientele. Greases & Lubricants: BLC is the largest grease producer in India having 3 mfg. plants in Chennai, Kolkata and Silvassa. It also focuses on R&D with an applications research laboratory in Kolkata. The firm is aggressively marketing its Balmerol brand and continues expanding its distribution network of 20 strategically located stock points, 250 distributors & 4,500 dealers in the country. Logistics: BLC has three state-of-the art Container Freight Stations located at Nhava Sheva, Chennai and Kolkata and offers a wide range of logistics solutions for ocean, air & road freight. These three ports do account for 54% of the total container traffic handled in Indian Ports. BLC is an established player in the Indian industrial packaging industry with 35% share in the 200 liter capacity steel drum segment. It holds the leadership position in this segment, market size of which is estimated to be 12 mn. units. It has a pan-India presence with over 6 drum mfg. facilities in Taloja (Mah. ), Asaoti (Haryana), Chennai, Kolkata, Chittoor (AP) & Silvassa. Shareholding % is: GoI 61.8, DIIs 10.9, FIIs 2.9, Individuals 18.3, Corporates 3.5, Others 2.6%. BLC has a focus on in-house R&D for all its manufactured products. Travel: In Feb 2014, BLC acquired the holidays brand “Vacations Exotica” (VEX) for Rs 20 cr., and became one of the top five leisure travel companies in India. VEX has been growing at 25% with revenues of Rs 120 cr. and a potential to rise to around Rs 450 cr. over 3-4 years (per management). BLC can now offer holiday packages and corporate travel services to its portfolio of corporate and govt. clients which number 7.5 lakh. The acquisition is yet to add to the bottom-line, and the accumulated loss is Rs 8-9 crore, but this year BLC will minimize loss and in FY18 is expecting profit. Currently, 90% of BLC’s travel business is from the central govt. and 10% from the private sector. This year BLC has targeted to increase the pvt. sector proportion to 25% over 2 years. BLC has embarked on a major technology upgrade for the travel segment, which will help to improve its service levels and reduce overheads. Greases & Lubricants: It launched the new TechTonic Pack for diesel and 4T oils for the auto sector. AVI-OIL India Pvt. Ltd is a JV between BLC, Indian Oil and NYCO France established in 1993 where BLC is a 25% partner. It is involved in indigenous production & supply of aviation lubricants to defense services & aircraft operators in India and manufactures aero engine oils, hydraulic fluids, greases, protectives & other specialty products for the aviation sector. Application Research Laboratory (ARL) has focused towards the R&D of high performance greases for steel and heavy duty open gear grease for sponge iron plants, engine oil for new generation passenger cars, power sector, fine blanking & cold forging (auto) and hobbling (gear mfg. industry). The ARL located in Kolkata, developed tribological solutions using “DEKATROL technology” which is eco-friendly, helps reduce frictional losses, enhance fuel economy and also life of the product. Logistics: During FY16 Logistics Services achieved a growth of 8% in topline which is on account of a surge (20% growth YOY) in air freight services activity. BLC plans to invest Rs 400 crore over the next two-three years, including Rs 60-70 crore during the current fiscal. Most of the investment would be in logistics business. BLC is setting up 3 cold chain facilities in Hyderabad, Delhi NCR and Mumbai and a multimodal logistics park at Vizag Port in JV with Vizag Port Trust (VPT). The project will be built over 53 acres of land. In this Hub, facilities will be created for handling Exim and Domestic Cargo. BLC is searching for a strategic partner to sell its loss making subsidiary Transafe Services Ltd. engaged in the business of container leasing and logistics services. Industrial Packaging: The new state-of-the-art barrel mfg. plant at Navi Mumbai has stabilized and being close to the large consumption centers in the Western Region, has a competitive advantage. There is a fall of available market size for BLC to an extent of 2 million drums per year due to GoI policy on procurement of Drums from MSME manufacturers. Also there are new entrants in Gujarat, Taloja and Chittoor (in and around the Fruit-pulp Market). Indian Travel and Tourism Industry: India has moved up 13 positions to 52nd rank from 65th in Tourism & Travel competitive index. Total contribution by travel and tourism sector to India’s GDP is expected to increase from US$ 136.3 billion in 2015 to US$ 275.2 billion in 2025. The number of Foreign Tourist Arrivals has grown at a CAGR of 3.7% to 5.29 lakh YoY in May 2016. Forex earnings during May 2016 grew at a rate of 8.2% YoY to Rs 10,285 cr. (US$ 1.52 billion). Tourists arriving on e-Tourist Visa during June 2016 totaled 36,982 registering a YoY growth of 137.7%. The industry may see good growth on the back of visa reforms. The rupee depreciation against major currencies has improved demand and positively impacted foreign arrivals as India becomes an affordable destination. The medical tourism market in India is projected to reach US$ 3.9 billion in size having grown at a CAGR of 27% over the 3 years, and is expected to clock over 20% gains annually through 2017. Indian Logistics Industry: India’s logistics sector is set for accelerated growth, led by GDP revival, ramp up in transport infrastructure, e-commerce, impending GST rollout, and ‘Make in India.’ Indian logistics market is expected to grow at a CAGR of 12.17% till 2020. Empirical evidence indicates that Indian logistics industry grows at 1.5-2 times the GDP growth. A large number of upcoming SEZs have necessitated the development of logistics for the domestic market as well as for global trade. Mumbai has emerged as the preferred location for the development of logistics parks with an investment of approximately $200 million. The development of seven to eight logistics parks are in pipeline on 600 acres around Mumbai. Poor Infrastructure, warehousing & storage and trade Regulations have been hindering growth. The proposed new GST regime and e-commerce will together alter the landscape in warehousing, supply chain management and third party logistics business particularly for organized sector. Indian Lubricants & Leather Industry: India is the 5th largest lubricant market in volume terms behind the US, China, Russia and Japan. In terms of revenue, the lubricants market size was valued at USD 37 billion in 2014, which is expected to surpass USD 74 billion by 2022, at a CAGR of 8.5%. Increasing automobile sales is expected to drive lubricants market size over the forecast period. India’s leather industry has grown well, transforming from a raw material supplier to a value-added product exporter. Today, around 50% of India’s leather business comes from international trade. The GoI had identified the Leather Sector as a focus sector in the Indian Foreign Trade Policy in view of its immense potential for export growth prospects and employment generation. Indian Industrial Packaging Industry: The packaging industry in India should reach $73 billion in 2020 from $32 b (FY15), per FICCI and TSMG. The Indian packaging industry constitutes about 4 % of the global packaging industry. (Source IBEF). Indian packaging industry is anticipated to register 18% annual growth, with the flexible packaging and rigid packaging expected to grow annually at 25% and 15%, respectively. Germany & Italy are the main suppliers of packaging machinery but emerging are Taiwan, Korea, China. There are about 600-700 packaging machinery manufacturers, 95% of which are from SMB. Competition is from alternative packaging like PE Drums, IBC/ISO Tankers/ Flexi – Tanks, etc. BLC indicated that sales volume in FY16 were marginally less than FY15 in spite of shrinkage of demand due to GoI directives to procure MS Drums only from Small & Medium Enterprises. BLC’s price history is detailed in Fig 2. The share price shot up sharply in 2014. Investors in BLC over 8 years got a return of 34% CAGR including bonus and dividends. Dividends have been generous, and are currently 180% or Rs 18/share giving 2.6% yield. The recent low is 491 in Feb 2016, and the high was Rs 748 in Sep 2016, so BLC has risen sharply this year, but is currently 7% below the highs. Revenues, EBITDA and Profits of BLC are up by 7%, 6.8% and 7.3% CAGR over 7 years. BLC has EBITDA and profit margins of 9.9% and 5.5% resp., which are good, see Fig 3. Current P/E is 11.86 times (of trailing twelve months earnings), while the Price/ Book is 1.71 times. The current valuations look reasonable, which is a positive. The Q1 every year (Apr-June) is the best by revenue. This may be due to the holiday season. But In Q1 FY17, revenues fell due to fall in aviation fuel price and austerity measures from the government. Debt equity ratio is 0.11 which is low. This is a sign of a healthy balance sheet. BLC has positive free cash flows over 8 years, and it has been investing this in assets, a positive. Fig 4. BLC balance sheet* has cash & equivalent (Rs 457), which is Rs 161/sh., so BLC operations are available for (677-161) = Rs 516. In Fig 5, the 8 year PE chart for BLC has historic avg PE of 8 times, a range of 4-12 times. Today it is at 11.86 times. The PE has recently fallen from a high of 13.66 times. With good cash levels and a healthy balance sheet, we expect PE levels to rise further. In Fig 6 we can see that the EPS TTM is rising in a steady fashion over the last 8 years within a channel. Beta of stock is 0.9 (Reuters) indicates lower than Sensex volatility, which is good. From Fig 7 we can see that the debt equity ratio has been reduced and is currently low. This is positive. The interest coverage ratio has improved. Dividend yield is healthy at 3%. The inventory turnover ratio improved, implying efficient inventory management. Operating & profit margins are flat to positive. BLC’s ROCE fell in the last five years, but it is still high at 21.1% in FY16. Similarly RoNW. The picture that emerges of BLC is a healthy balance sheet, conservative financials and improving cash. In a benchmarking exercise we compare BLC with listed peers in similar businesses. See Exh 8. From the exhibit, we can see that BLC has low valuations and high dividends. Margins are low but steady. Similarly the 3 year growth numbers. Return ratios are high for the peer group. Debt is low. Interest coverage is good. This is consistent with its conservative PSU character and steady performance so far. If we bring together the solid past with the recent good growth initiatives, a positive picture emerges. The financial projections for 3 years for BLC in Fig 9 are based on conservative assumptions of investments in operations, stability in crude prices at current levels and no dilution of equity base. Based on projections and a target PE of 12, we project a Mar 2019 price of Rs 1057, a 56% upside from current levels. It has diversified businesses and even during poor economic cycles, BLC has not been hit. The BLC stock has low beta, with stability of a large cap, and the returns, growth potential and upside of a small cap. Strong balance sheet, low debt and good cash balance provides stability and room for growth. BLC has been consistently generating high dividend yields and has robust ROCE numbers. Many of the BLC businesses are high potential with good growth prospects, including Travel & Tourism, logistics, lubricants and industrial packaging. With good investment plans across businesses, BLC is showing a new found aggression. BLC also has exited some legacy businesses with bad returns, such as tea. This too is a bold step. As a Mini-Ratna I PSU, BLC can invest up to Rs. 500 crore or equal to their net worth, whichever is lower without explicit government approval. This allows BLC to move fast on investment plans. A likely partial disinvestment in future could give a temporary downside pressure on the stock price. In the import-export trade, there is an ongoing reduction in volumes through ports due to slowdowns in developed economies and China. This may affect the logistics business. BLC may face competition from packing products like PE Drums, and IBC/ISO Tankers/FlexiTanks. BLC profitability is exposed to volatility in commodity prices, especially crude oil & steel, which impact the industrial packaging and oil & lubricants divisions. The travel business faces low entry barriers, threat of govt./PSUs withdrawing the preferred travel agency status and efforts from airlines for direct sale of tickets. BLC will mitigate this by distribution on online portals and focus on value added segments of leisure travel. BLC is over dependent on GoI/ PSEs for its ticketing business as around 90% comes from public sector. There is competitive pressure for Balmerol with established brands such as Castrol, Veedol & Gulf enjoying a lion’s share in the retail lubricants business. BLC is facing challenges with delayed payments from public sector customers. Shipping lines/ CHAs & Forwarders continue to exert pressure for payment of increased incentives for moving their boxes to a particular Container Freight Stations (CFS) & demand more storage free days. Being a small cap share, there can be low trading volumes on the exchanges. At first glance BLC looks like a small cap that is a complex conglomerate with legacy issues. However on closer analysis we can see that it is into 4-5 high potential segments which together give it a stable portfolio. BLC is shedding / closing down the weak businesses, and investing in the potentials. The balance sheet of BLC is excellent with low debt, good cash and is strengthened by free cash flows. With a small and stable equity base, it appears likely that BLC will reward shareholders with higher dividends, splits and bonuses in the next few years. BUY Balmer Lawrie with a Mar 2019 target price of Rs 1057, a 56% upside from current levels. Note on * – we made an edit to this report on 19th Oct, removing an erroneous calculation.